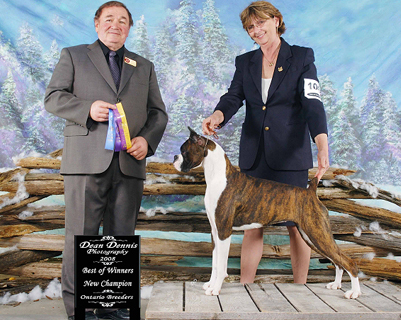 BOW and new champion under judge Dave Patterson with Mary Curl handling. Health: Heart: SAS clear and one 24-hour holter monitor test (Oct 2008 = 5 VPCs). About Abby . . .
After much soul searching and . . . yes, for those that know her . 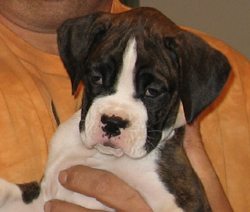 . . tears on Patti's part, Abby went to live with Mary Curl of Shadowdale Boxers. It was the right decision for all involved even though Patti really, really wanted to keep Abby along with her brother Declan. 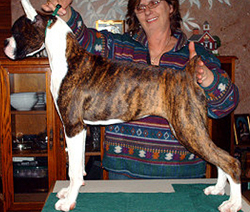 Mary Curl is the breeder of Sawyer, who is Abby's dam. We knew that Abby would have a wonderful home and a great life and we couldn't be happier for both Mary and Abby. You can also see Abby on the Shadowdale web site, where Mary has a web page and photo album set up with many fabulous pictures of Abby. 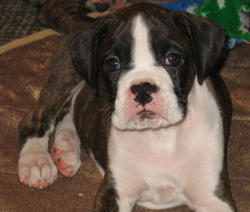 Abby is a litter mate to Declan, Rooney, Lennon, and Rocky who have all been showing in Canada. I didn't want to lose what they had given me and when the opportunity to have Abby came along I was overjoyed. As it turns out Abby is more than just that. When she arrived I fell in love. She is playful but also introspective at times. She is a thinker . . . and way too smart for her own good. 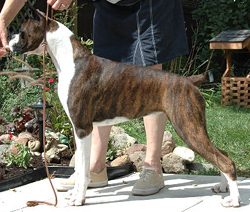 If dogs re-incarnate I have to say she is Sara (Ch Shadowdale's Fire 'N Ice C.G.C.) one of my special heart dogs, come back. The mannerisms and way she goes about things are just what Sara would do. She makes me laugh. She is absolutely wonderful with my Granddaughter Christina who at 5 1/2 may just show her in Junior handling this fall." 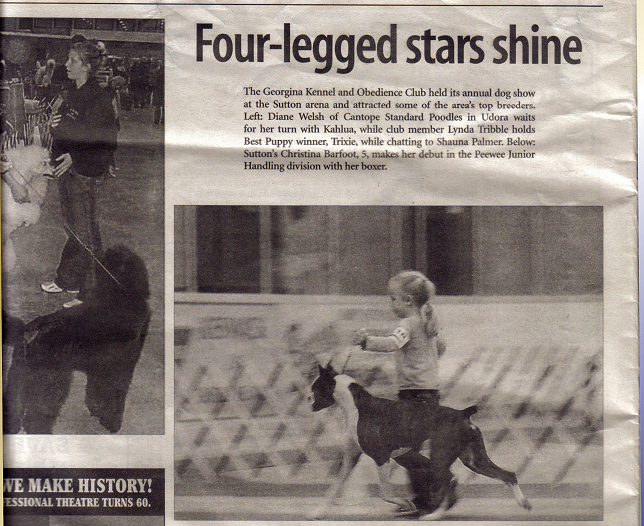 It turns out that Mary's grand-daughter, Christina, did show Abby in junior handling. She did fabulously, and even made the Georgina, Ontario newspaper! Abby’s show career . 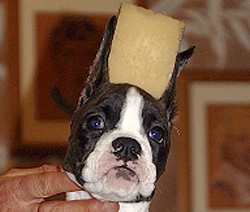 . .
Abby and Mary only entered two shows while Abby was a puppy. 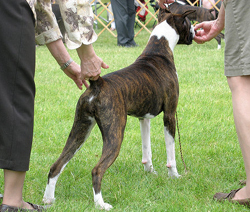 The first time Abby was a junior puppy at an all breed dog show and the second time she was just barely a senior puppy at the Boxer Club of Canada Specialty. Abby is slow to mature, and Mary had decided to hold her back until she was ready. As Mary will admit, Abby is just "touch" spoiled . 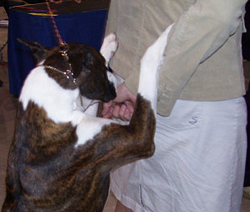 . . but now knows what is expected of her when in a conformation ring! 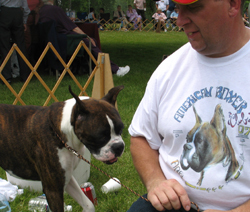 On 28 and 29 April 2007, Abby went reserve female both days in a row at the Victoria County Kennel Club dog show at Oakwood, Ontario under judges Walter Pinsker and Terry Carter. She was shown by Mary. 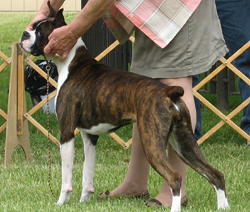 On 03 June 2007, Abby was in the 9-12 brindle class under judge Shirley Bell at the Boxer Club of Canada Specialty at Oshawa, Ontario. Abby had only turned 9 months old a few days prior to the specialty show and although she had lots of fun, she did not place in her class. Abby was shown by Mary Curl. 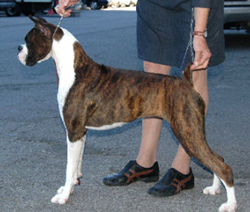 On 19 October 2007, Abby gets winners female for one point under judge Donald Duncan at the Bellevile & District Kennel Club dog show in Chatham, Ontario. She was shown by Mary. 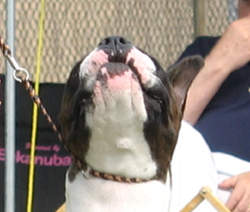 On 10 November 2007, Abby gets winners female and best of winners for five points under judge Olga Gagne at the Georgina Kennel and Obedience Club dog show at Stutton, Ontario. She was shown by Mary. 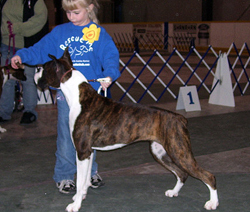 On 23 February 2008, Abby gets winners female for 3 points under judge Lucie Paradis at the Ontario Breeders Association dog show at Markham, Ontario. 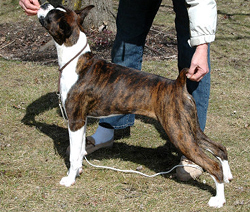 On 25 February 2008, Abby gets winners female and best of winners for 1 point under judge Dave Patterson at the Ontario Breeders Association dog show at Markham, Ontario. She was shown by Mary. This win makes Abby a champion! 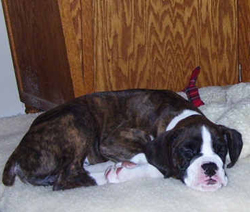 Abby at various stages in her life . . .
Abby loves her kibble and never misses a meal. Abby posing pretty for the camera. 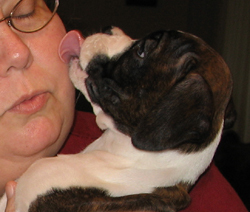 Abby kissing Patti as she leaves for Mary's home. Abby just before she heads for the airport. Abby arrives at Mary's home ready to play! Abby at 10 weeks of age. 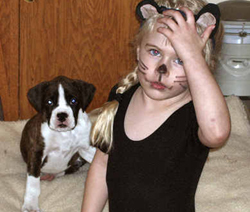 Abby gets along fine with kitty-cats! 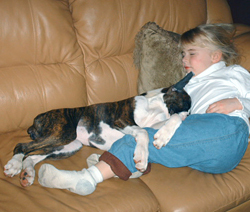 Abby and Christina play hard and sleep hard. Abby resting after a day full of adventure. 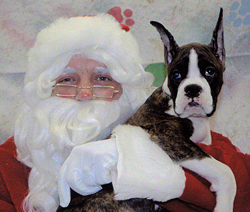 Abby has her first visit with Santa. 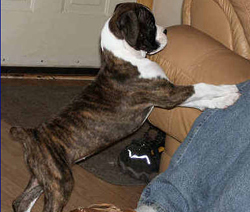 Abby at 5 months being stacked by Mary. 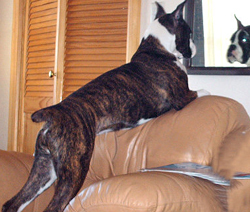 Abby admiring her reflection in the mirror. 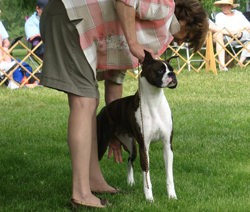 Abby in the Boxer Club of Canada Specialty ring. 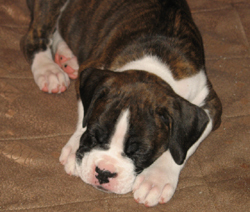 Abby still in the Boxer Club of Canada ring. Abby showing just a little bit of attitude in the ring! Mary stacking Abby in the BCC specialty ring. 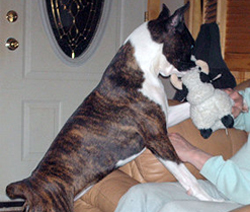 Dave playing with Abby by ringside. Abby in a determined and playful mood. 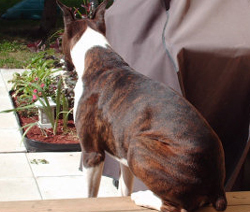 Abby sitting on the deck as only a boxer would. 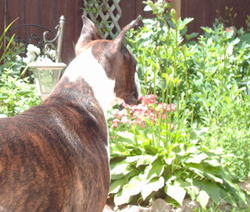 Abby in the garden on a beautiful sunny day. Abby working hard at being a show dog.! Abby being stacked at one year of age. Abby the weekend that she got her first point. 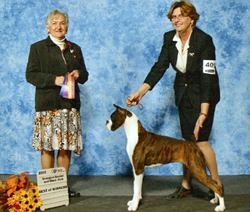 Abby gets BOW under judge Olga Gagne. It seems that Abby really really wants that bait! Christina practicing junior handling with Abby.